Art and Medicine Bibliography, Charles B. Brigham. Subperiosteal Excision of the Entire Scapula and Head of the Humerus: Recovery. Warren, J. Collins., M.D., ed. & Mason, A. L., M.D., asst. ed. volume XCVIII., no. 15 (April 11), pp. 455-458, ill.
4 photographs (heliotypes) on 2 pp. heavy paper stock. 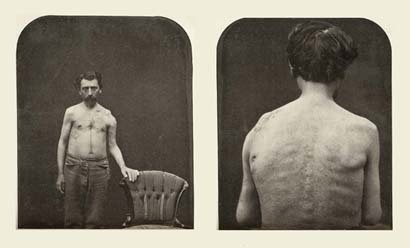 Brigham presents the case of Maurice Kahn, a 36 year old man who came to the French Hospital in San Francisco with extensive abcessing fistulas in the right axilla and shoulder regions. In surgery, Dr. Brigham found the necrosis of the shoulder blade and head of the femur to be more extensive than he imagined and made the decision to remove the entire scapula and the head of the humerus. Maurice subsequently recovers with considerable use of his arm. The first two photos show the post operative subject from the front and behind. 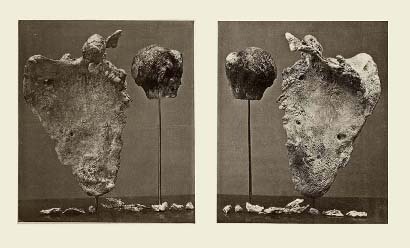 The second two images also show front and back views of the bone specimens.